NECKLACE & EARRINGS SET - SARAH COVENTRY. "CHARISMA" FROM 1973. 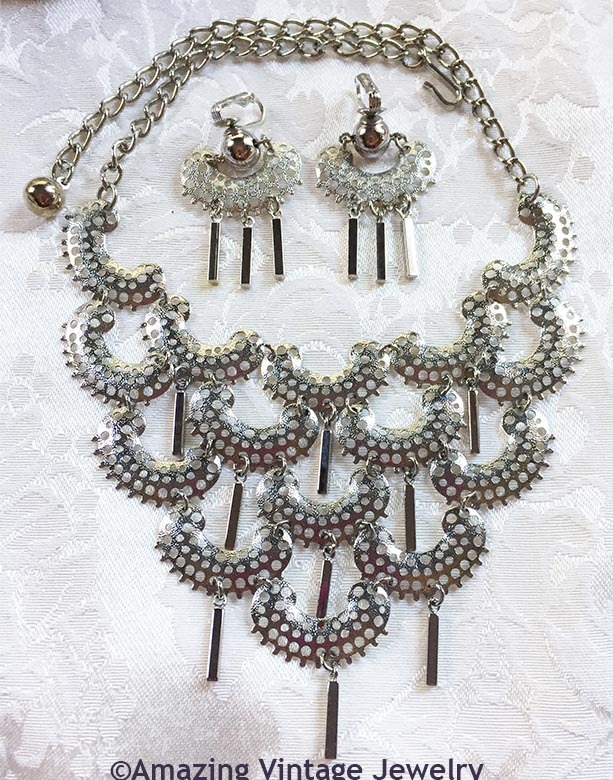 WHEN ONLY A BOLD STATEMENT WILL DO: HEAVILY TEXTURED, HINGED LINKS WITH DANGLES FORM A GORGEOUS SILVERTONE BIB. NECKLACE IS ADJUSTABLE UP TO ALMOST 17" IN LENGTH. 3 7/8" WIDE IN THE CENTER. VERY GOOD CONDITION. EARRINGS ARE CLIP. 1 9/16" LONG, 1 3/16" ACROSS. VERY GOOD CONDITION.